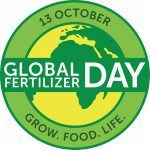 Global Fertilizer Day is held every year on October 13, to highlight the role fertilizers play in agriculture. As it falls on a Saturday this year, we and the other the International Fertilizer Association (IFA) members are observing it today October 12th. Fertilizer plays an integral role in producing the foods we eat. There’s no doubt, based on all the studies available, how important it is to feeding the world. We all know that the nutrients our industry provides are important to support the crops we need to feed our growing population, but it has benefits for us humans as well. Click the button below to view and download a wonderful graphic that was produced by IFA to show just how important plant nutrition is to human nutrition. In celebration of Global Fertilizer Day, The Fertilizer Institute (TFI) has produced a great video highlighting the people our industry serves: Farmers. We all work together toward the common good, but Farmers are the front line. Take a moment to view the video and share it to help us all celebrate them.